I’ve been busy making things for an upcoming craft fair and I discovered a great technique for making cushion covers. I use the envelope enclosure style because I like the added detail of the buttons on the back. (This is a great tutorial from Cottage Magpie if you are new to this technique.) 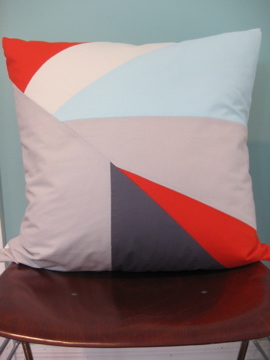 In the past I used whole cloth to make cushions and I was pretty pleased with the results. 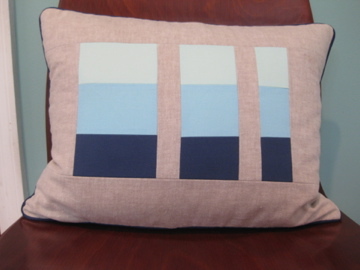 For these cushions, I wanted to piece the front and I wasn’t sure how to enclose the seams in the back. I didn’t want to quilt the cover because I wanted a smooth, polished look. What to do? Then I was perusing Etsy and I read about a cushion maker who lines her covers with muslin. Ah ha! I made my pieced cushion front and then cut a square of natural, fine muslin the same size. Next, I basted to the two pieces with wrong sides together (making sure to remove any stray threads). Finally, I serged all around the edge. For the back pieces, I made a seam along one long edge (right sides together) then turned the piece right side around. Then, I basted and serged these pieces. I made button holes in the top piece of the “envelope.” To finish the pillow, I followed the regular method. I am so pleased with the polished finish the lining gives. The cushions really hold their shape, and the covers have a nice weight to them. 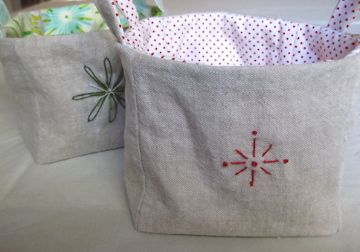 I’ve also been making these little linen baskets. I love using some of my patterned fabrics! This entry was posted in small projects and tagged Cottage Magpie, craft fair, cushion tutorial, how to sew a cushion cover, linen basket on November 8, 2013 by brigitdermott. Hi Angela–your tutorial is the best! Thanks for writing such clear instructions! Thanks! I use Robert Kaufman Essex Linen. This is yarn-dyed flax, which is a great basic linen. Actually it is a cotton linen blend, which I think would work well for printing. Can’t wait to see your results. I love printed linen!